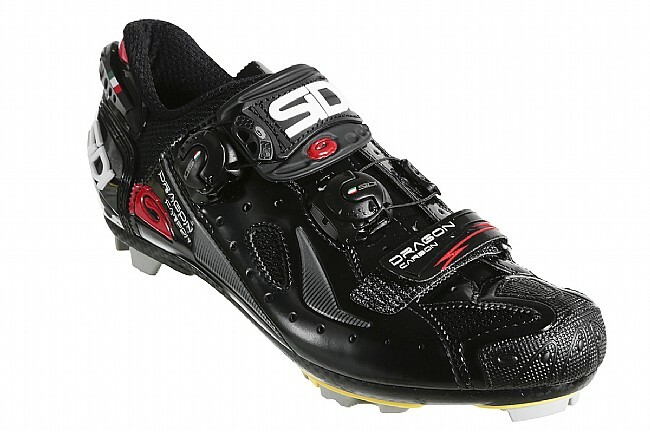 The Sidi Dragon Carbon 4 Mega MTB shoe is the prime option for burning up the trail. 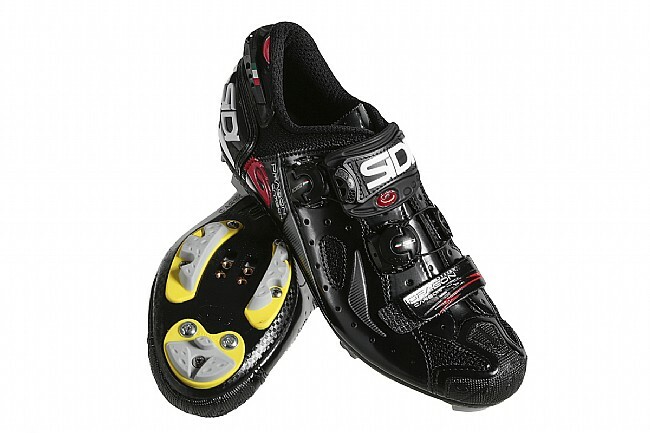 Using Sidi's high-volume Mega last as a starting point, this updated model features an anatomically curved Soft Instep 3 Closure over the top-foot to disperse upward forces during your backstroke for secure and comfortable pedalling the whole way round. 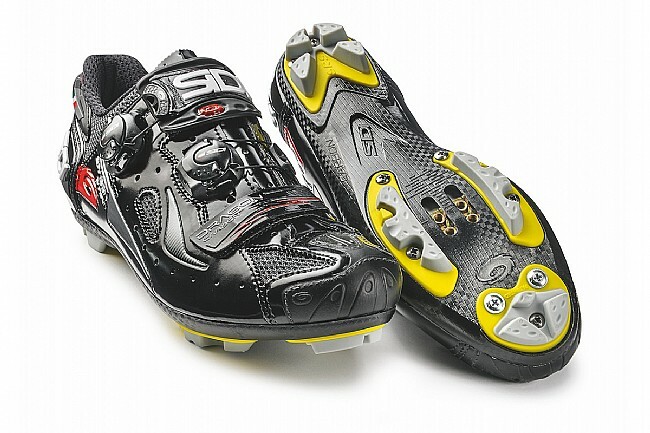 It's cinched down with one of the two Tecno-3 dial adjusters on each shoe for a precise fit, and the upper is of course constructed with Sidi's renowned synthetic leather for a sleek look and bombproof construction. 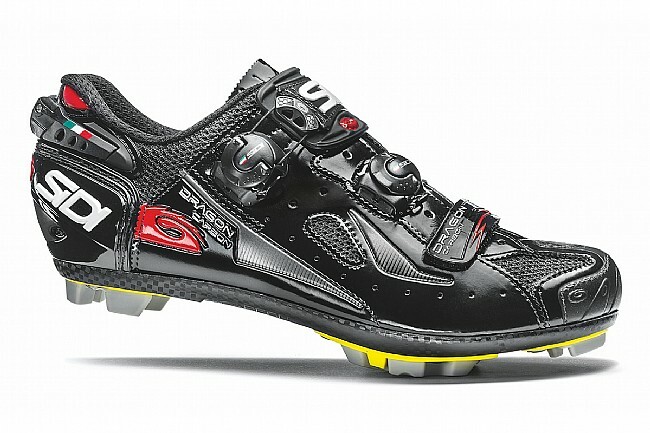 Other standards include Sidi's Heel Cup and Adjustable Heel Retention Device to keep your heel planted during steep uphill attacks, and all that power is expertly transferred to the pedals through the Sidi Dragon 4's SRS Carbon Composite Sole for finely-tuned stiffness, lightness, and comfort. 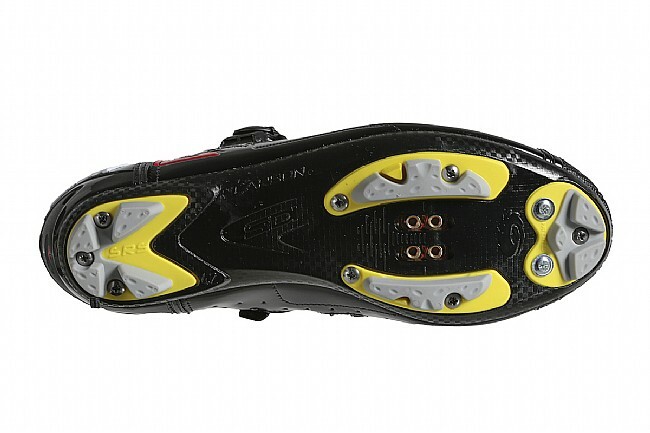 The Dragon 4 Mega is 4 mm wider across the ball of foot and also roomier in the heel and higher in the instep. Replaceable SRS sole. Toe-spike compatible. Compatible with two-bolt mountain cleats. Solid shoe delivering a dialed in fit. I have logged about a 1000 miles on my gravel bike with these babies. Excellent power transfer with the sole and the footbed has not given me any hot spots. The dial retention system has been flawless, even with mud packed around them. The heel retention system seemed a little extreme until I tightened them down and low and behold it actually works. Keeps my heel solidly planted in the shoe without rub or constriction.